There are several free Ouija board readings available online. You can try some of these out to see the type of responses you receive. Some provide very sophisticated programs while others seem more limited in their response capabilities. The Ouija board offered by My Ghost Story is the closest virtual board you can get to a real Ouija board online. My Ghost Story offers a touchscreen planchette. Theoretically, you could operate the planchette the same way you would a real one. You may use it by yourself or get a couple of friends to try it with you. Dubbed, The Enfield, the board was created by artist Dan Lake who states he was inspired by the movie The Conjuring 2 (The Enfield Haunting). The website instructions warn to keep your questions short and uncomplicated, so you don't confuse the spirit(s). 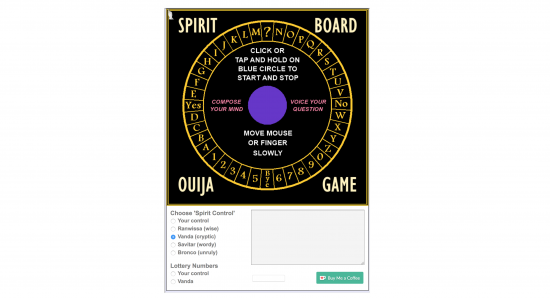 Before you close the screen, be sure you bid the board and spirits goodbye by moving the planchette over the word. BrainJar is a website offering helpful tutorials, articles and a few experiments in programming that you can test out or play, such as the Ouija board. 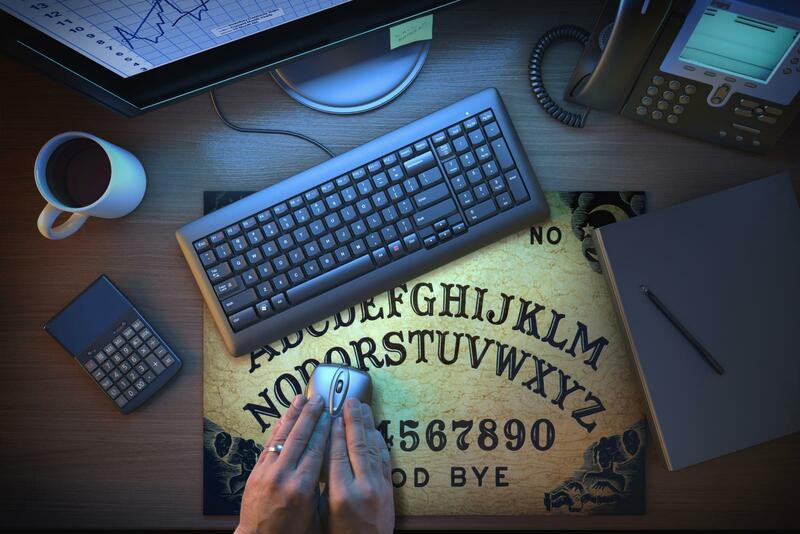 To use the Ouija board, you must type your question and then move the mouse to hover over the planchette. When the planchette begins to move, you need to move your mouse to keep up with it or the planchette will stop. Each letter will appear in the response box below the Ouija board. When finished, the planchette stops in the center of the board. Be sure you click goodbye just as you would with any Ouija board reading. Psychic Science offers a Spirit Board Ouija Game. You have the option of selecting the type of spirit control you wish, such as your control or one of their computerized spirit personalities. These include Ranwiss (wise), Vanda (cryptic), Savitar (wordy) and Bronco (unruly). You can also request lottery numbers with you on control or rely on Vanda. The Ouija board provided online with e-Tarocchi is intuitive in its responses. It is very similar in design as BrainJar's but doesn't provide a response bar, so you'll need to pay close attention or have someone jot down the letters for your response message. Scientific Psychic is a Ukraine software development company featuring an Ouija board game touted as an online virtual spirit board that actually works. The game is above the average online Ouija board with a greater response range. In fact, if you ask the same question in different ways, after several tries the spirit states it is wary of your questions. If you persist, it grows sarcastic and if you continue to ask the question but in different ways, it eventually insults you. It may state that you're self-centered or some other unflattering comment. This type of highly developed game progression and response makes it feel like an authentic Ouija board online that many people may find it entertaining. Shop of Little Horrors provides an intro to their Ouija board game describing how people believe their board is just a game until they use it. The intro then explains how the website has been contacted by users trying to verify that it's just a game. These users are surprised by how accurate their readings are. You must enable your flash player. The intro is well-done with a macabre animation. Beside the question box, there is a box with a few hints about how to ask your questions. You need to engage the board by asking its name and go from there. If you don't form your questions so the algorithm can understand, the planchette vibrates wildly. The responses are appropriate, but only if you've asked your questions the right way. The Museum of Talking Boards claims to be "the Internet's leading website on Ouija Boards past and present." The website features a classic online Ouija Board. 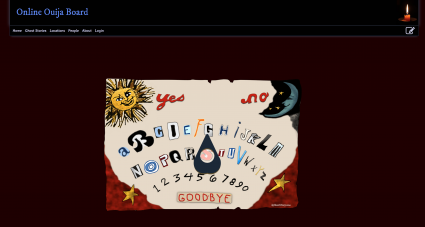 You can type your questions and move the mouse over the planchette, making sure to follow it as it moves about the board. You may wish to try out some of the historic Ouija boards or spirit or mystic boards featured on the website that are historic. Do Online Ouija Boards Really Work? Is there a free online Ouija board that really works? This can be answered by those who use them. Some boards are clearly games that are limited by their algorithms. However, a true virtual board that allows you to open communication with the spirit world can work the same way a board in the physical can work. The success in contacting the spirit world depends on the individual and if they are attuned to the frequencies of that world. When that connection is established, it's believed the spirit world is invited into this dimension. Some free online Ouija board readings are limited while others are highly intuitive, and some offer a very real experience with touchscreen capabilities. When it comes to a free Ouija reading, choose the one that offers you the best experience and results.